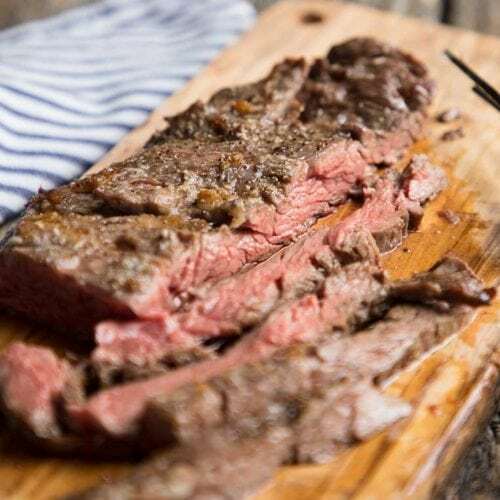 Learn how to broil skirt steak and flank steak that stays juicy and tender from oven to table and is ready in 15 minutes or less. It’s one of my secrets to really fast dinners everyone loves! Use this basic salt, pepper, and olive oil version to get yourself started, then feel free to throw in marinades, seasonings and whatever flavors you enjoy. 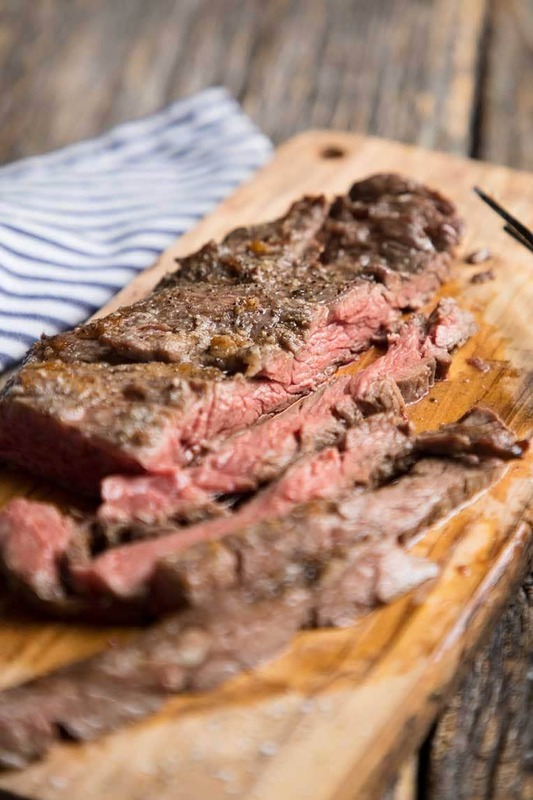 What is the difference between skirt steak and flank steak? Both cuts come from the abdominal area of the cow. The skirt steak comes from the diaphragm area–but both have worked hard and can be tough if they aren’t cooked and sliced correctly. Skirt steak is cheaper than flank steak where I live and tends to be a smaller cut than the flank, but you cook both with the same technique and both have great beef flavor. 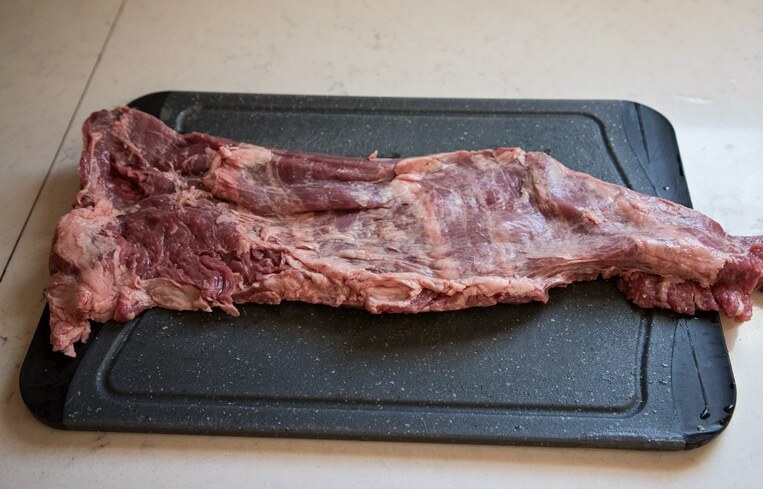 You can learn more about the differences between skirt steak and flank steak here. 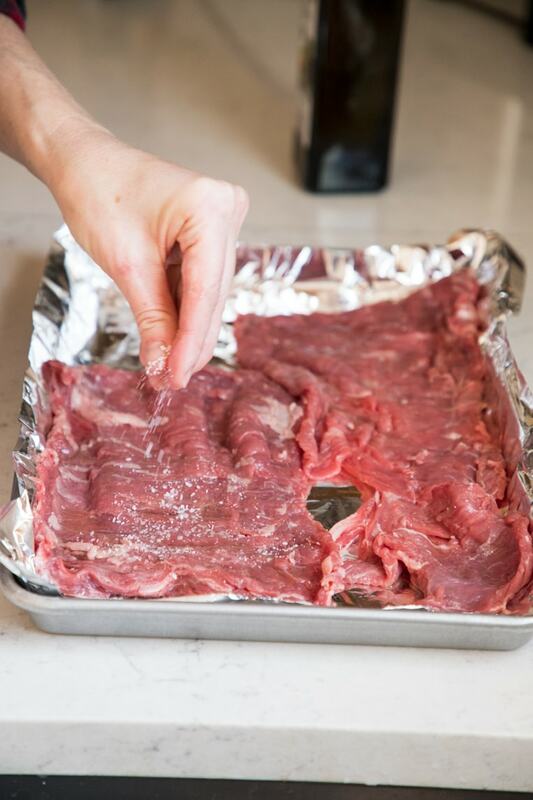 Can I marinate skirt steak or flank steak overnight? Yes. Thankfully these tougher cuts can hold up to marinating very well. Throw it in anything you’d like and let it sit covered in the fridge–it will probably help tenderize the meat even more. Both skirt steak and flank steak beg for high heat and searing for a short amount of time. Leaving the inside a bit rare will help ensure tenderness and flavor. That’s why broiling or grilling are such great techniques to use for these cuts. 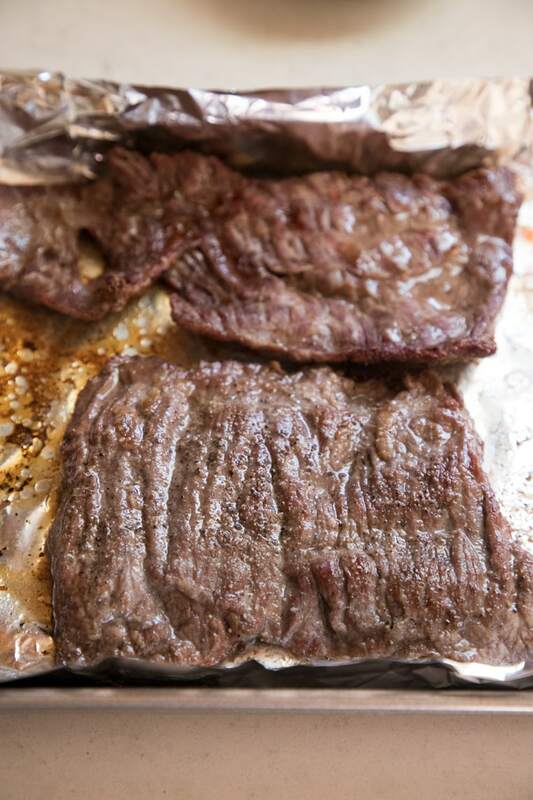 Remember skirt steak is thinner than flank steak and will take significantly less time to cook. Open the package and unfold it. Take it out of the package and unfold it so it’s one layer. You’ll also notice that it has one side that has more fat on it than the other. Position this side up so we can get ready to remove some of that. 2. Remove the connective tissue on one end. Starting at one end, loosen the thin, almost blueish white connective tissue that covers the steak. You only need to loosen a bit of it so you can grab on to it and pull it away. 3. Use a paper towel to peel away most of the tissue. 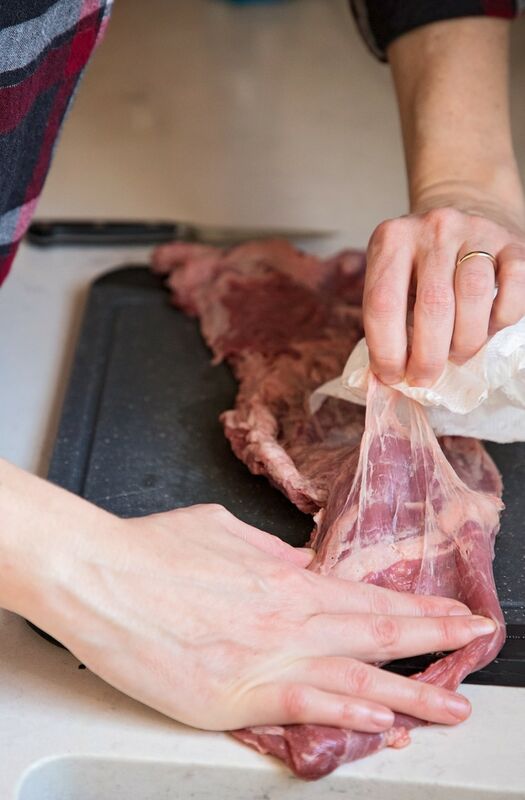 Grab the loosened connective tissue and pull back toward yourself while holding the steak down with the other hand. You may need to repeat this process a time or two before you get the majority of the tissue off. Use your knife to loosen any stubborn spots and cut away any big bits of fat. You won’t get it all off–that’s okay. Just get what you can. 4. 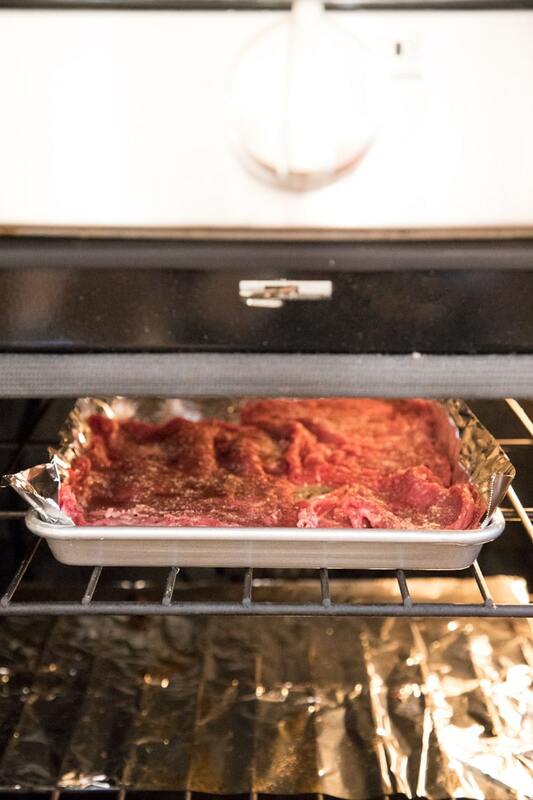 Line a baking tray with aluminum foil and lay your steak on. If your steak is very long, you may need to cut it in half. Drizzle both sides with regular olive oil, vegetable oil or avocado oil–something that won’t smoke like crazy in the oven. Maybe a tablespoon total for the whole thing. 5. Sprinkle both sides with salt and pepper. Make sure to get all of the surfaces well. How much salt you’ll need will really depend on the size of your steak, but a teaspoon to a teaspoon and a half of kosher salt is plenty. If you are using regular table salt, use 3/4 of a teaspoon for the whole steak. 6. Broil it hot and fast. Most broilers only have off and on. But if yours has a high and low setting, go with the highest one you have and get the oven rack as close to the top of the stove or near your element as you can. You want this steak to cook hot and fast. Broil one side for about 4 minutes, flip it and broil 3 more or so or to desired doneness. Flank steaks can be up to an inch thick, so you may need to broil it longer if you want it more well done. Use a meat thermometer if you aren’t sure and try to avoid cutting in to your hot steak to check the center. All the juices will leak out. 7. Let the steak rest for 10 minutes. If you cut in to it too soon, all the juices will leak out and you’ll have a piece of tough rubber on your hands. This is a good time to pay attention to the grain of your steak. Take a look at which way the lines are running. In this picture you can see that they run up and down. You’ll want to cut against the grain, or left to right to ensure your meat is tender and easy to eat. 8. 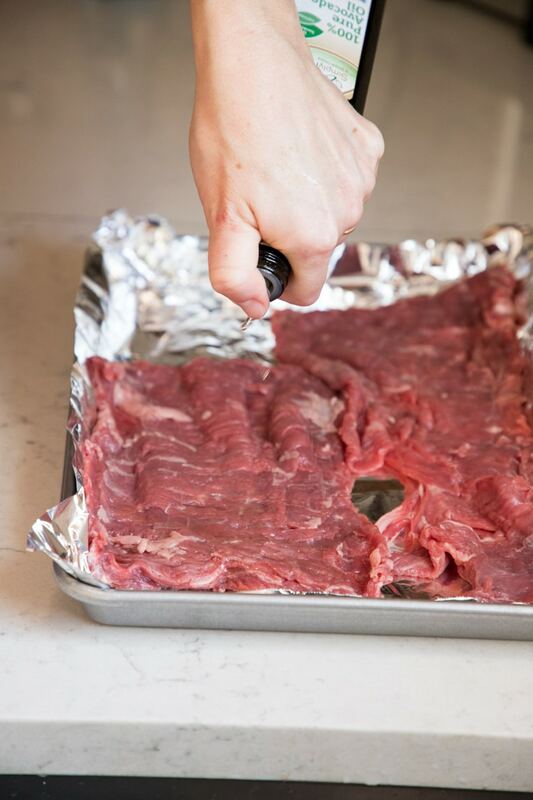 Slice your steak in to thin strips. 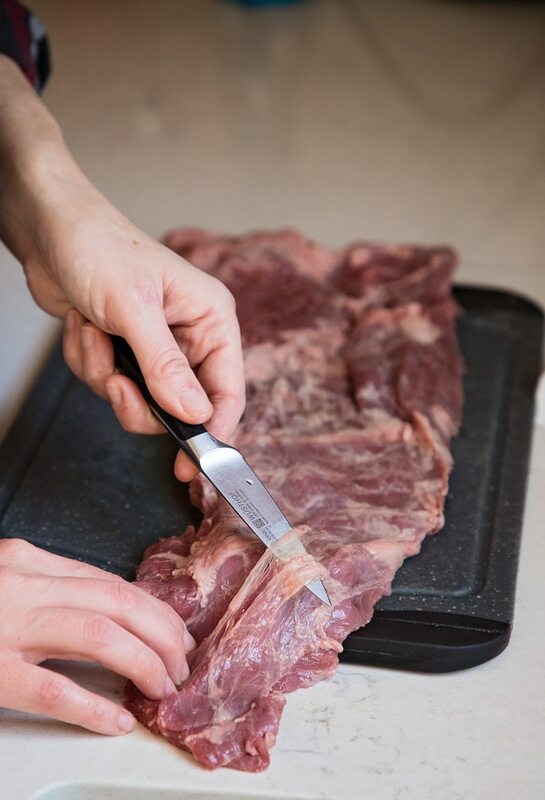 Depending on how you will eat your broiled skirt or flank steak will depend on how thickly you cut it. Thinner pieces will always be better for fajitas, or our favorite–steak salads. Do you have any recipes for a mexican dish called Alambre made with skirt steak (flanl staek. I ahd it at a mexian restaurant once & it was absolutely delicious.